© 2019 Seyedmoharrami et al. Organizational climate and organizational commitment have a tangible effect on organizational performance. This study aims to investigate organizational climate in a university of medical sciences along with organizational commitment and job burnout in the university staff. This cross-sectional study is carried out via descriptive-analytical method on 250 employees of Torbat Heydariyeh University of Medical Sciences, Iran in 2016. Data collection tools include standard questionnaires of organizational climate, organizational commitment, and Maslach burnout inventory. Data analysis was carried out with SPSS software version 21 and Man-Whitney statistical tests, Kruskal-Wallis analysis, ANOVA, Chi-2, and Spearman’s correlation tests. Average age of the participants was 34.52 ± 7.70 including 55.6% men and 44.4% women. In the present study, organizational climate of employees was medium and high, and also, mean score of the organizational commitment of subjects was 66.11 ± 16.35. The highest amount of employees job burnout was related to low level (66%). Organizational climate among the employees lead to higher organizational commitment (r=0.472, P<0.001), and greater organizational climate and commitment contributes significantly towards a decrease in job burnout (r=-0.227, P<0.001; r=-0.335, P<0.001). If the managers of these deputies pay more attention to the importance of the services of the health staff and manpower employed in this organization, they can improve the organizational commitment of healthcare workers and prevent their burnout, in order to maximize the quality of service delivery. Keywords: Burnout, Employees of the University, Organizational climate, Organizational commitment, Healthcare workers, Service delivery. There are some criteria and indicators that can be used to measure the health and dynamics of an organization. One of the most important indicators is organizational climate . Organizational climate is a set of characteristics describing an organization and affecting employees’ behavior . Organizational climate is a tool to distinguish one organization from the other and also refers to employees’ understanding of their working environment; so that employees’ understandings and deductions form the organizational climate [2, 3]. Organizational climate has four dimensions. The first dimension is the interpersonal relationship between the employees which indicates trust, cooperation-based climate, and competition-based climate, quality of the relationships in different sections of the organization, and support or rejection behaviors toward new employees. Other dimensions of organizational climate include hierarchical nature of the organization, challenging or boring nature of the work, and focus on support and incentives of employees . An appropriate organizational climate can be useful to motivate the employees, improving employees’ spirituality, improving people’s cooperation in decision makings, and increasing innovation as an important source of mental health, and vice versa. Therefore, any changes in different sections of the organization lead to immediate and deep change of employees’ performance . Organizations need efficient and committed staff. Lack of commitment to the organization, insufficient accuracy in performing the responsibilities, and lack of cooperation and active involvement are among the most important problems of executive systems which form a gap between human resources and organizations. To overcome this problem, promoting commitment to the organization is one of the best strategies [6, 7]. Organizational commitment is a job attitude that reflects employees' loyalty to the organization and is a continuous process where employees of an organization express their interest in the goals and values of the organization . The position of organizational commitment is such that it is considered as the main attitude of the ruling on work . Organizational commitment is an important variable in understanding employees' behavior, which, by affecting the performance of employees, increases productivity, service delivery and improves their quality . Job burnout is one of the occupational hazards that results in lower efficiency and loss of human resources due to adverse physical effects and psychological complications . Lack of a proper organizational climate for human resources provides grounds for their burnout . Occupational burnout is a psychiatric syndrome consisting of emotional exhaustion, depersonalization, and a reduction in the sense of individual's success that appears among medical staff more than other occupations . In a study by Glisson and Green (2011), it is indicated that organizational climate is one of the main elements in achieving a desirable work approach among employees of an organization . Zohar and Luria believe that organizational climate is an element that reflects common understanding of the organization's employees towards the working environment and shapes their feelings toward the organization . The reported results of Wahee and Grover indicate that factors such as justice, working conditions, job security, job salaries and benefits, comfortable work environments, and effective training can produce a significant effect on job satisfaction of individuals . A study, by Usman and Raja in Pakistan, indicated that private sector employees have higher levels of job burnout compared to governmental employees . In a study by Bte Marmaya et al. on employees in Malaysia, organizational commitment was negatively related to job burnout, and those who had more commitment toward their organization had experienced more stress than individuals with less commitment . The reported results of Kouhi et al. indicate that organizational commitment has a direct and significant relationship with group mentality, intimacy, consideration, seclusion, influence, dynamicity, and emphasize on production; moreover, it has an indirect and significant relationship with disturbance . The previous studies have recognized the importance of organizational climate, job satisfaction, and job burnout [1, 5, 20]. Providing mental and physical health to human is important, and in this regard, universities play a vital role in the development in any country. Therefore, the present study intends to investigate the organizational climate among Torbat Heydarieh University of Medical Sciences staff; it also examines the organizational commitment and job burnout levels among its employees. Accordingly, the research hypotheses were as follows: 1. there is a significant relationship between organizational climate and organizational commitment among the university staff. 2. There is a significant correlation between organizational climate and job burnout in the university staff. 3. There is a significant relationship between organizational commitment and job burnout among university staff. This cross-sectional study is carried out via descriptive-analytical method on 250 employees of Torbat Heydarieh University of Medical Sciences in Razavi Khorasan province, Iran in 2016. The samples were selected by simple random sampling from the studied population. An inclusion criterion was at least 2 years of work experience at the University of Medical Sciences. The data collection tool consisted of two parts: the first part was related to demographic information including gender, type of employment, work experience and workplace of the person, and the second part included organizational climate questionnaire, organizational commitment and burnout that were used from Iranian versions. Sussmaan and Deep questionnaire was used for evaluating organizational climate . The questionnaire has 20 descriptive words and is scored on a Likert scale from totally agree to totally disagree. The sub-scales of this questionnaire include clarity and purpose agreement, clarity and agreement of roles, satisfaction with rewards, satisfaction and agreement on procedures and the effectiveness of communication. The total score for the organizational climate questionnaire ranges from 0 to 80; so that 0 to 27 is weak, 27 to 40 is medium, and 40 and higher is strong. This questionnaire has been validated in Foladvand’s study with Cronbach alpha 0.89 . In order to measure organizational commitment, the organizational commitment questionnaire of Mawday, Steers and Porter was used . This tool includes 15 items that are based on a 5-point Likert scale. The minimum score is 15, the maximum score is 105, and a high score indicates a desirable organizational commitment. The organizational commitment questionnaire was validated via Cronbach alpha 0.83 . In the present study, validity of the questionnaire was 0.8. Maslach and Jackson burnout questionnaire consists of 22 phrases that measure three aspects of occupational burnout, including emotional exhaustion, individual success and depersonalization. Nine questions are related to emotional exhaustion, 5 questions related to personality deprivation, and 8 questions related to personal competence. Four burnout values are determined based on cutting values, emotional exhaustion ≤ 25, personal success ≤ 11, and depersonalization ≤ 16. No burnout occurs when the values of all the three scales are lower than cutting values, mild burnout occurs when the value of one scale is lower than cutting values, medium burnout occurs when the values of two scales are lower than cutting values, and severe burnout occurs when all the three scales are lower than the cutting values. Maslach and Jackson estimated inner validity for all the sub-scales and reported the inner consistency of the questionnaire to be 0.9-0.71 with alpha coefficient . Akbari et al. validated the Persian version of this questionnaire using Cronbach alpha 0.84 . The collected data were analyzed via SPSS software version 21, descriptive statistical indicators (frequency, percentage, mean, and standard deviation), and inferential statistics (Man-Whitney test, Kruskal-Wallis analysis, ANOVA, Chi-2, and Spearman’s correlation). The mean and standard deviation of the subjects in this study were 34.52 ± 7.70 years. 139 participants (55.6%) of the samples were male and 111 participants (44.4%) were women. 62 (25%) of them were corporal recruitment employees, 148 (59%) of them were contract employees, and 40 (16%) of them were official employees. 24 (9.6%) participants worked in treatment deputy department, 72 (28.8%) participants worked in health deputy department, 95 (38%) participants worked in development deputy department, and 59 participants (23.6%) worked in teaching hospitals. Among the employees of the University of Medical Sciences, organizational climate score of 28 participants (11.2%) was weak, score of 56 participants (22.4%) was medium, and score of 166 (66.4%) participants was strong. According to Table 1, there was a significant statistical difference between the variable levels of organizational climate, gender, and job category (P < 0.05). The score of organizational climate was higher in men than in women. Officially hired employees had a stronger organizational climate score. Also, people with higher than 10 years work experience and those working in the treatment deputy department had a higher organizational climate score. Mean and standard deviation of organizational commitment score of the employees at the University of Medical Sciences was 66.11 ± 16.35. The mean of organizational commitment score between weak, moderate and strong levels was statistically significant (P < 0.05). Employees with a strong organizational climate score had a higher organizational commitment score, as presented in Table 2. Fig. 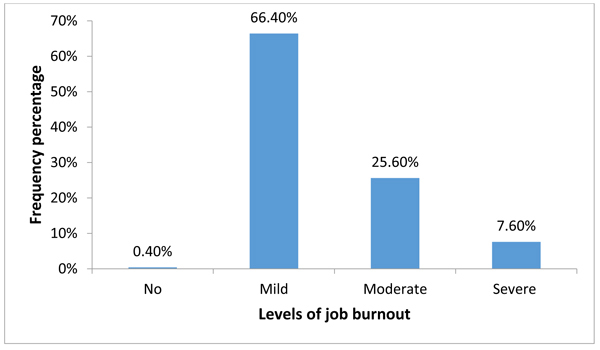 (1) Indicates the level of occupational burnout among the employees of the University of Medical Sciences, from the level of no burnout to severe, which shows that the highest percentage of burnout is related to low level with the value of 166 (66.4%). Table 3 indicates the relationship between organizational climate, organizational commitment and occupational burnout of all employees using Spearman correlation test. There was a significant and direct correlation between organizational climate and organizational commitment scores of the whole employees (r = 0.472, P < 0.05), however, there was a significant and reverse correlation between organizational climate and burnout (r =-0.227, P < 0.05). Also, there was a significant and reverse correlation between organizational commitment and burnout (r =-0.335, P< 0.05). Fig. (1). Levels of job burnout in studied subjects. Table 1. Organizational climate score based on demographic variables in studied subjects (n= 250). *Statistical Test, aMann-Whitney Test, bKruskal-Wallis Test. Table 2. The relationship between organizational climate and organizational commitment in studied subjects. Table 3. The relationship between organizational climate, organizational commitment and job burnout using spearman correlation test. *Correlation is significant at the 0.01 level. One of the most important factors in the modern world of business is human resources of organizations. In this regard, organizational climate is undoubtedly one of the factors that increases the value of employees to the organization . On the other hand, positive and excellent organizational climate has a significant impact on the performance of Human Resources Management (HRM) and can encourage employees to identify shortcomings and make them more hard working . In this study, organizational climate value was medium (22.4%) and high (66.4%) among employees. An examination of organizational climate shows that university employees feel good about their work environment. The results of Dargahi et al. indicated that each organization has its own unique climate, which, if consistent with employees’ goals, roles and expectations, are evaluated positively by them . People who are more compatible with the organization are more motivated and have more chances to promote to higher positions and have deeper participation in organization affairs . Helping to solve work environment problems, respecting each other, providing a suitable environment for creativity and initiative and support for managers can help to create a suitable climate for office systems . In addition to the expertise, organizational characteristics and size can have a major impact on organizational climate . Managers have recognized the importance of organizational climate in this organization, but they have to work harder to achieve a more desirable situation. Here, men had better organizational climate score than women. Official employees had a stronger organizational climate score. Also, employees with a high work experience had a higher organizational climate score. In the study of Suki et al. employees' gender had no effect on their perceptions of working conditions, and men and women had similar job satisfaction . Women have different expectations from men, and each society has its own culture. The reported results of Noordin showed that employees of a private company had a poor organizational climate score . The conditions of employment and occupational safety of individuals may be influential factors in the high organizational climate score. Organizational commitment has attracted many researchers over the past three decades, and organizational managers who are eager to improve productivity have paid more attention to this issue . In this study, the mean score of organizational commitment of employees was 66.11. Previous studies have shown that organizational commitment has a major impact on the success of an organization . Because a committed employee who identifies the organizational goals and values has a greater willingness to join the organization and is willing to show more organizational citizenship behavior. On the other hand, they consider their employees as part of the organization and accept almost any kind of job assignment to be able to work for the organization. According to the results of this study, employees with higher organizational climate score had higher organizational commitment score. It was observed that people with a high professional background and official employment had a stronger organizational climate scores, so as higher organizational commitment scores. In the study of Gemlik et al. personnel with higher work experience had a greater commitment to the organization . According to Grover et al. age and work experience had a significant impact on job satisfaction and commitment of individuals . People who have been working for a long time in an organization may lose their confidence, after which the feeling will increase the level of commitment of people and cause them to stay in the same organization to maintain their status . On the other hand, in the study of Marmaya et al. individuals with higher commitment to their organizations experience more stress than those with less commitment . There was a direct and significant relationship between organizational climate and organizational commitment of employees, in other words, as the organizational climate of the employees increases, organizational commitment increases as well. The significant relationship between organizational climate and commitment was consistent with the reported results of Delgoshaie et al. . In clarifying the abovementioned explanation, we can point to Dessler's viewpoint. Dessler’s studies indicate that, in order to increase motivation and spirituality, employees’ needs should be provided in the organizational climate, and only those managers can address the needs of employees and increase their commitment toward the organization that create an appropriate organizational climate and within the organization . Awareness of managers from this positive relationship can lead to application of system management to find ways to reduce the chance of absenteeism and minimize other negative aspects at work. Studies have indicated that creating a better organizational climate is one of the key factors in increasing job satisfaction and employee efficiency, preventing loss of talent, and reducing job stress . In the study of Noordin et al. organizational commitment of the employees was low. Because employees were not happy with their salaries and benefits and felt that they would not be properly rewarded for their performance . Therefore, enough salaries and benefits can ensure productivity and reduce absenteeism and stress. In the present study, there was a reverse relationship between organizational commitment score and occupational burnout in the employees, in other words, the higher the organizational commitment score, the lower the burnout rate. The results of this study are consistent with the results of studies by Marmaya et al. and El-Demerdash et al. [18, 33]. An analysis of the information about determining the burnout rate of the personnel showed that there was almost an amount of burnout among all the employees at the university. The highest level of burnout was related to mild level (66%), moderate level (25%) and then severe level (8%). Employees are subject to multiple stresses due to the nature of their jobs. High workload, shortage of human resource, time pressure, high expectations of customers, low level of work and lack of incentive system, introduction of new systems into old system, and lack of timely training of people about them are among the main causes of employee burnout [20, 27, 30]. In the study of Bozorgi et al. emergency medical staff had different levels of burnout . El-Demerdash et al. also reported that two thirds of nursing employees had a high level of burnout, which was related to the time spent in direct contact with the patient . The results of Nagar et al. showed that burnout was recognized as a serious concern among employees, and those who had more burnout indicated lower job satisfaction . There was a reverse relationship between organizational climate and burnout of employees. In other words, the higher the level of organizational climate, the lower the burnout rate. Moderate and severe occupational burnout among employees with low level of organizational climate was reduced up to 57.1%, among employees with moderate level of organizational climate up to 48.2%, and among employees with strong level of organizational climate up to 24%. According to the results of this study, people with higher work experience had a stronger organizational climate, and high occupational burnout could be attributed to employees with low work experience. The results of several previous studies showed that by increasing age and work experience, burnout was reduced [36, 37]. Perhaps aging increases the experience of individuals in dealing with occupational issues, and higher work experience helps people recognize the nature of their work and the environment, on the other hand, expectations of individuals in the early years of their work lead to organizational burnout . In this regard, meeting expectations of employees at any level can increase job satisfaction . The results of this research have implications for the management of healthcare institutions as employee job burnout may have important outputs for the organization. Burnout can also result in decreased employee involvement with the job and decreased job satisfaction. Since health workers are a valuable resource to health care centers, organizational managers should consider administrative and organizational issues such as job satisfaction, organizational commitment, trust and organizational support, appropriate systems for management, leadership and implementation of the rules, and positive relationships between different departments and working groups. In explaining this concept, issues such as employee participation in decision making, democratic administrative mentality, employee encouragement, open and fair management, and prioritization of employees’ needs are important . Regarding occupational burnout of the employees in this study, managers should take this issue seriously and regularly evaluate the nature and form of job satisfaction and organizational trust, and then apply appropriate measures to improve them, until the quality of service delivery is maximized. The limitations of this study are that it was conducted at the level of a city on employees of an organization with a cross-sectional method and participants also completed the questionnaires to show their free and honest feelings; however, it was not assured that the respondents had answered all the items honestly although they were provided with clear instructions before and after their completion. It is recommended that in future studies, topics including occupational stress, mental fatigue and chronic illness of health workers be investigated. Likewise, influential variables such as family issues, financial status and living environment, managerial support, job security and differences between governmental and private sectors should be examined. Based on the results, the employees showed a high degree of burnout despite their organizational climate and commitment, and their burnout status needs to be further improved. Regarding different levels of occupational burnout in the employees and its consequences for the quality of service delivery, managers can take meditative and preventive strategies to address this phenomenon. This study is based on a research project approved by the Ethics Committee of Torbat Heydariyeh University of Medical Sciences (IR.THUMS.REC.57.1394.57). The authors would like to thank all subjects who cooperated in the implementation of the research. Nopasand SM, Malekakhlagh A, Kavemoghadam SH. Examine the relationship between organizational climate and organizational commitment with regard to job satisfaction. International Conference on Management 2015; 1-16. Dargahi H, Musavi M, Shaham G. Organizational climate of hospitals at Tehran university of medical sciences. J Health Adm 2013; 15(50): 31-40. Hunter EM, Perry SJ, Currall SC. Inside multi-disciplinary science and engineering research centers: The impact of organizational climate on invention disclosures and patents. Res Policy 2011; 40(9): 1226-39. Pourezzat AA, Ehsani MN, Yazdani HR, Faez K. Comparative Analyze of the Impact of Several Dimensions of Organizational Justice on Organizational Climate and Organizational Loyalty: (A Research on an IT Based Organization) 2013. Sabeti Z. The relationship between organizational climate and morale of teachers in primary schools in Qom 2000. Barzoki AS. asghari J. The relationship between organizational socialization and organizational commitment in Kurdistan Province Gas Company. J Change Manag 2010; 2(3): 109-27. Shaemi A. asghari J. The relationship between organizational socialization and organizational commitment in Kurdistan Province Gas Company. J Manag Res 2010; 2(3): 109-27. Beiginia AR, Sardari A, Ashourizadeh A. Study of the realthionship between individual and organization values with of employees organization commitment (Case study: Al-Mahdi aluminium company in hormozgan province). Management Researches in Iran 2013; 17: 19-42. Ng TW, Butts MM, Vandenberg RJ, DeJoy DM, Wilson MG. Effects of management communication, opportunity for learning, and work schedule flexibility on organizational commitment. J Vocat Behav 2006; 68(3): 474-89. Ouyang Y-Q, Zhou W-B, Qu H. The impact of psychological empowerment and organisational commitment on Chinese nurses’ job satisfaction. Contemp Nurse 2015; 50(1): 80-91. Guan S, Xiaerfuding X, Ning L, et al. Effect of Job Strain on Job Burnout, Mental Fatigue and Chronic Diseases among Civil Servants in the Xinjiang Uygur Autonomous Region of China. Int J Environ Res Public Health 2017; 14(8): 872. Zheng W, Yang B, McLean GN. Linking organizational culture, structure, strategy, and organizational effectiveness: Mediating role of knowledge management. J Bus Res 2010; 63(7): 763-71. Bozorgi F, Laali A. Prevalence and factors associated with burnout in emergency medical‎ workers in Mazandaran University of Medical Sciences. Majallah-i Danishgah-i Ulum-i Pizishki-i Mazandaran 2014; 24(112): 2-7. Glisson C, Green P. Organizational climate, services, and outcomes in child welfare systems. Child Abuse Negl 2011; 35(8): 582-91. Zohar D, Luria G. Climate as a social-cognitive construction of supervisory safety practices: scripts as proxy of behavior patterns. J Appl Psychol 2004; 89(2): 322-33. Grover H, Wahee SJ. Study on factors influencing job satisfaction of employees in Delhi/NCR. International Journal of Business Management. Special Issue on Role of Statistics in Management and Allied Sciences 2013; 3(2): 101-12. Usman M, Raja NS. Impact of job burnout on organizational commitment of public and private sectors: A comparative study. Middle East J Sci Res 2013; 18(11): 1584-91. Bte Marmaya NH, Hitam M, Zawawi N, Jody JM, Eds. Organizational commitment and job burnout among employees in Malaysia. Proc Intl Conf on Bus and Econs Res 2011. Koohi Rostamkalaee Z, Tol A, Akbari Haghighi F, Rahimi Froshani A, Pourreza A. Assessing the Relation Between Organizational Climate Components with Organizational Commitment Components Among Nurses in Selected Hospitals of TUMS. Health Syst Res 2013; 9(7): 731-40. Bigdeli Z, Momeni E, Ghanbari Mehrniyat K. An investigation of the relationship between organizational atmosphere with job burnout and job satisfaction of ahvaz academic librarians. Sci J Manage Syst 2017; 2(4): 83-92. Sussman L, Deep S. The communication experience in human relations 1989. Foladvand K. The relationship between organizational climate and the mental health of hospital workers in Ilam State Hospitals. J Ilam Uni Med Sci 2007; 15(1): 44-50. Mowday RT, Steers RM, Porter LW. The measurement of organizational commitment. J Vocat Behav 1979; 14(2): 224-47. Rezapour Y. Factor Structure, Validity and Reliability of School Organizational Health Questionnaire (SOHQ) in a sample of Iranian teachers. Journal of Instruction and Evaluation 2017; 9(36): 109-30. Maslach C, Schaufeli WB, Leiter MP. Job burnout. Annu Rev Psychol 2001; 52(1): 397-422. Akbari R, Samar RG, Kiany G-R, Eghtesadi A-R. Factorial validity and psychometric properties of maslach burnout inventory –The persian version. Knowledge & Health 2011; 6(3): 1-8. Gemlik N, Sisman FA, Sigri U. The relationship between burnout and organizational commitment among health sector staff in Turkey. J Global Strategic Manage 2010; 8: 137-49. Zhang J, Liu Y. Organizational climate and its effects on organizational variables: An empirical study. Int J Psychol Stud 2010; 2(2): 189. Dargahi H, Musavi M, Shaham G. Molai zadeh A. Organizational Climate of Hospitals at Tehran University of Medical Sciences. J Health Adm 2013; 15(50): 31-40. Suki NM, Suki NM. Job satisfaction and organizational commitment: The effect of gender. Int J Psychol Res (Medellin) 2011; 6(5): 1-15. Noordin F, Omar S, Sehan S, Idrus S. Organizational climate and its influence on organizational commitment. International Business & Economics Research Journal 2010; 9(2): 1. Top M, Gider O. Interaction of organizational commitment and job satisfaction of nurses and medical secretaries in Turkey. Int J Hum Resour Manage 2013; 24(3): 667-83. El-Demerdash S, Abdelaziz A, Abdelsalam G. The Relationship between Burnout and Organizational Commitment among Nurses at Tanta University Hospitals. IORS-JNHS 2013; 2(6): 20-8. Delgoshaei B, Tofighi S, Kermani B. The relationship between organizational climate and organizational commitment in teaching hospitals of Hamedan University of medical sciences. Quarterly of Horizon of Medical Sciences 2009; 14(4): 60-8. Dessler G, Starke FA. Management: principles and practices for tomorrow’s leaders 2004. Aziz Nejad P, Hosseini S. Occupational burnout and its causes among practicing nurses in hospitals affiliated to Babol University of Medical Sciences, 2004. Majallah-i Danishgah-i Ulum-i Pizishki-i Babul 2006; 8(2): 63-9. Nagar K. Organizational commitment and job satisfaction among teachers during times of burnout. Vikalpa 2012; 37(2): 43-60.